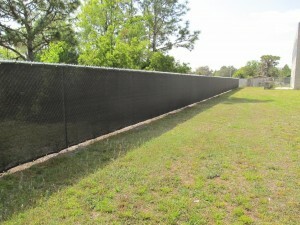 While school security experts typically recommend that fencing for schools permit open viewing to reduce crime, there are exceptions. Because this Florida school serves a number of autistic children and has a swamp located next to this side of the school, the installation of screening materials to conceal the water is both logical and prudent as many autistic children are attracted to bodies of water. Many people desire absolute answers when it comes to school safety. There have been several attempts to create a national school security codes similar to that of the national fire code. Each of these efforts have failed for a variety of reasons. The lack of some types of data for violence prevention in contrast to the fire science field is one reason for this. In addition, the many types and methodologies for violence are perhaps more complex than fire is. For example, when you install entry point metal detection at a school, an aggressor may simply shoot students on a school bus or as they wait in line to be screened. This means that the implementation of this approach can require additional solutions to prevent simply moving the attack site. When we install fire sprinklers in a school, the fire will not move to the parking lot to avoid the suppression system. Reviewing some of the standardized school security requirements that have been implemented at the state level reveals that these problems are a challenge even at that scale. Another reason it can be so difficult to establish set requirements for school security is that a textbook answer for most schools could increase danger in a school with a unique situation. As one example, while the research demonstrates that natural surveillance (improving the ability for people to see and be seen) reduces the opportunity for crime and the fear of crime, there are cases where improving natural surveillance can increase risk. Some of our independent schools educate children of famous people who could be at risk for abduction or even murder. We have clients who have individual students assigned with armed bodyguards all day, every day by their parents. The abduction for ransom of the daughter of a prominent pasta company owner from a Florida independent school many years ago is an excellent example of this very real risk. A kidnapper posing as the father’s bodyguard signed the girl out from an independent school using a fake letter from the child’s father. She was buried in a box in a swamp and held for ransom. For this reason, we advise some of our independent school clients with this type of risk to use visual barriers on fencing for playgrounds contrary to the normal practice of maintaining open sightlines. As one professor in my graduate business school program told us many years ago, the correct answer is sometimes IAD – it all depends. When a student asked for a clear cut answer to a specific management issue, the professor explained that the correct answer would depend on specific variables. He was not dodging the question but instead cautioning us to take care not to create absolute answers when it would be less effective to do so. School and public safety officials should heed this advice.